You can add your existing financial data from Quicken, MS Money or other programs that have the ability to export QIF or OFX files, as well as import/export accounts and transactions from/to CSV file format. When it comes to creating an account, you can choose the currency, opt for trading accounts, insert details about your business, such as name of the company, address, contact person, phone number, and email address, as well as add information about counters, namely number and format for bills, customers, employees, jobs, orders, vendors and others. There’s support for different accounts that you can choose from, such as payable, receivable, asset, bank, cash, credit card, currency, equity, expense, income, liability, mutual fund or stock. Additionally, accounts can be edited or deleted. GnuCash gives you the freedom to cut, copy, paste, delete or duplicate transactions, and set the reconcile status of a transaction. A smart feature included in the package enables you to set up scheduled transactions by entering the name, frequency, start and end date, and number of occurrences. Additionally, you may print several standard Quicken Checks or generate a custom check format. You may register customers, vendors and employees by adding info about the company name, address, phone number and other personal details, as well as generate and track invoices and bills. 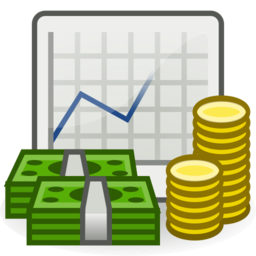 What’s more, you can perform searches in order to find transactions or business related data, create a loan repayment scheduled transaction, record stock splits, track/modify the value of a currency, mutual fund and stocks with the aid of the Price Editor, and calculate compound interest. Last but not least, the application puts at your disposal a set of comprehensive reports and charts. You can build up general reports which include information about accounts, taxes and transactions, generate assets & liabilities reports, as well as other reports related to income and expense, and business data. The reports and graphs can be printed or exported to HTML file format. GnuCash delivers a clean and well-organized layout of your business data but you should take into account that it eats up CPU and memory, so the performance of your system may be hampered.